Sexton has set forth an argument that he claims is the death of the full preterist view of eschatology. (It is more than interesting that one person after another jumps up and claims that they are the answer to the full preterist paradigm! They are the great defenders of the faith. They are the champions of truth and orthodoxy! No one can answer them). Sexton’s argument in summary is that unless the judgment is future, and the judgment of justification is then projected backward into our present, then there is no such thing as justification. He further claims that if the judgment is past, fulfilled in AD 70, then there can be no salvation today. I have responded to Sexton’s argument in a variety of ways. First, I have noted that Biblically, unless the parousia has occurred there is no salvation today, since Jesus was to appear the second time, apart from sin, to bring salvation. I have appealed to Hebrews 9:28-10:37 showing that Christ was coming to bring salvation and he was coming “in a very, very little while, and will not delay.” Sexton has refused to deal with this truth. Literally not a word. I did not ask Sexton what preterists believe. I did not ask what he takes for granted about what preterists believe. No, I asked Joel Sexton to tell me what the Bible says about when the judgment, when Christ’s coming to bring salvation, was to occur! And, Joel Sexton refuses – adamantly, totally refuses – to answer that question. He just says he knows what preterist believe about that! And yet, Sexton says I am the one that obfuscates, evades and avoids answering the issues! Why won’t Sexton openly, candidly answer the question about what the Bible says about the time of the judgment, choosing instead to just condemn my appeal to those passages? To answer honestly is to falsify his entire argument and he knows it. Thus, nothing but silence. Now make no mistake, I have stated that I accept and teach the truth that Paul does speak of the future judgment and righteousness being bestowed at that time (Galatians 5:5 / 2 Timothy 4:8f). I do not deny that at all– I affirm it! For Sexton to claim that this is a fatal admission, simply reveals that he does not even understand what I (and other preterists) actually believe! I affirm that Paul believed in the forensic (to use that term) justification of the believers before the End. He lived in the full confidence and expectation that the parousia of Christ was so certain – and so imminent – that the “righteousness” to be given at that Day (2 Timothy 4:8) was being “applied” before the End. (In reality, that time of righteousness salvation and redemption was guaranteed by the charismatic gifts. This means that if that time of justification and righteousness has not come, then of necessity we should still have the full operation of the charismatic gifts operative in the church today. Will Sexton affirm and accept this implication of his own doctrine?). First, the Bible no where teaches that after the Day of the Lord there would be no further justification. It teaches just the opposite. Sexton’s claim is specious. This is the fundamental, foundational, erroneous tenet of Sexton’s claims. That means that his “implication argument” is false. Second, as just noted, the Bible is undeniable clear in positing the judgment as imminent in the first century. Peter wrote, “the time” (literally, the divinely appointed time), “has come for the judgment to begin” when Peter wrote 1 Peter 4:17). Will Joel Sexton bow to this inspired testimony, or continue to ignore it? I should insert here that Sexton stridently objected when I introduced passages that show continuing justification and salvation after the end (e.g. Romans 13:11f / Revelation 21– and I could add Isaiah 65-66 and a host of other texts. 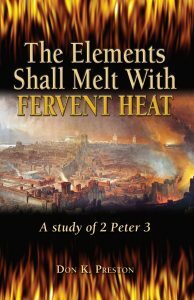 See my book The Elements Shall Melt With Fervent Heat in which I prove this very effectively). Sexton’s response to those passages? He has claimed that my appeal to those passages is a “Red Herring Argument.” Exactly what is a Red Herring Argument? You need to know. This book has a great discussion of life on earth, salvation continuing- after the End! A Red Herring Argument is an argument introduced into a discussion that is totally irrelevant to the actual discussion. With that in mind, remember that Joel’s argument is that if the Lord came in AD 70, there is no on-going justification, no on-going salvation. Well, the two passages that I introduced, Romans 13:11f / Revelation 21, directly address that issue. They both address the issue of morality and righteousness after the end, and evangelism after they end! Thus, they are not Red Herring Arguments. Joel’s objection to their introduction simply illustrates that he knows that if those texts – and others – are allowed into the discussion, then his “narrowly focused argument” is exposed as fallacious. To claim that there is no justification after the Day of the Lord, but then to reject any consideration of passages that speak to that very issue is to exhibit the worst sort of closed mindedness. These texts are only “irrelevant” in Joel Sexton’s mind, not because they do not address his arguments. To ignore, indeed, to ridicule and condemn, the introduction of texts that directly address the subject under consideration is the worst sort of hermeneutic. There is no text that suggests that there is no justification, no evangelism, after the end. That is an empty claim. Instead, as I have argued with Sexton repeatedly, and have been repeatedly ignored, unless Christ has come there is no salvation today. We are still waiting. But, let me proceed Responding to the Critics. To set the stage for this article we need to understand two Biblical terms, justification and righteousness. Now, I am not going to go into an exhaustive linguistic study of these two words, except to note that both words are intrinsically related, stemming from the same root dikaiosune. To justify is the verbal form, righteousness is the noun form that speaks to the result of justification. There are nuances that one can explore and that are fascinating, but to reiterate, these words are not drastically, fundamentally, or radically different from one another. Stated simply, to be declared justified is to then stand as righteous; see Joel’s quote above where he asserts this very thing. (It is interesting that Sexton claims that I don’t understand justification because of my church of Christ background, and yet, I agree with his definition of justification and righteousness given above! His accusation is just another example of his insulting and purposefully offensive verbiage). If one has not been justified there is no righteousness. The righteous are the justified. One has but to read scholars such as N. T. Wright, Richard Hayes, and others to read extensive discussions of these words. Notice the seventy weeks were determined to bring in everlasting righteousness. What this means is that Joel cannot claim that my introduction of this passage is a “Red Herring Argument” since he admits that justification and righteousness go hand in hand. Now, it does not say that seventy weeks were determined to initiate righteousness, and then to wait for its full arrival at some imaginary end of time judgment. There is no additional bringing in of everlasting righteousness beyond the end of the seventy weeks. That is totally foreign to the text and context. Daniel’s prophecy is almost certainly built on and drawn from numerous prophecies from Isaiah, perhaps chief among them Isaiah 65-66 and the prophecy of the coming New Creation. Peter, citing Isaiah, foretold the New Heavens and New Earth “wherein dwells righteousness” (2 Peter 3:13). That means that justification dwells in the New Creation! In other words, this is the consummative world of righteousness being foretold in Daniel. And in 2 Peter that world arrives at the Day of the Lord. It does not terminate the time of justification, it fully establishes it as an eternal reality (Isaiah 66:22f). So, we have a wonderful chain of discussion: Isaiah 65-66–> Daniel 9–> 2 Peter 3–> Revelation 21-22. (These are but a few of the links in the chain that could be discussed. I list these since they are the “major” players). So, if the everlasting world of righteousness of Daniel 9 is the New Creation World of righteousness of Isaiah 65-66, and 2 Peter 3 and Revelation 21, this means several things. First, it means that justification is an on-going reality, after the Day of the Lord. Isaiah 65-66 posits continuing life, even continuing evangelism (Isaiah 66:19f) – on earth, after the Day of the Lord – just as I have argued with Sexton – an issue he has only ridiculed. Second, if the everlasting righteousness of Daniel 9 is the arrival of the world of righteousness of Isaiah 65-66, and 2 Peter 3 and Revelation 21-22, then since Isaiah 65-66 posits the arrival of that world of righteousness at the destruction of Old Covenant Israel and Jerusalem, (Isaiah 65:13f- “The Lord God will slay you…”) that means that the judgment is past. Yet, justification and righteousness continue to be offered and found in the New Creation. That is undeniably clear in Isaiah 65 and 66 where life, even sin and evangelism, continues after the Day of the Lord. It is taught in Revelation 21-22 where, after the end, the nations of the world come into the City to find healing and life. Third, the second point is confirmed in Daniel 9. The arrival of the world of everlasting righteousness is limited to the seventy weeks. When did the seventy weeks end? At the destruction of Jerusalem in AD 70– Daniel 9:26-27. See my book, Seventy Weeks Are Determined…for the Resurrection for a powerful discussion of this. Some claim that the seventy weeks ended in AD 34-35, but that is untenable. If that is the case, then it must be true that the world of everlasting righteousness of Isaiah 65-66, 2 Peter 3 and Revelation 21-22 is a totally different everlasting righteousness from that predicted by Daniel. This is true because as noted, Isaiah 65-66 posits the arrival of the world of righteousness at the time of the destruction of the Old World– the Old World that could not give life or righteousness (Galatians 3:20-21). That did not happen in AD 34-35. So, just like Isaiah, Daniel posits the arrival of everlasting righteousness at the time of the destruction of the Old Covenant City of Jerusalem. Not only that, but Peter and John (Paul also, Galatians 5:5) were patently still anticipating the arrival of the New Creation, where righteousness dwells, well after AD 34-35. Thus, since they were still looking for the arrival of the world of righteousness foretold by the OT prophets, then if the seventy weeks ended in AD 34 and the “everlasting righteousness” foretold by Daniel arrived at that time, then one must produce the OT prophecies of another world of righteousness that is different from and additional to Daniel 9. That cannot be done. Do you see what Sexton is doing? First of all, note that he tacitly admits that the judgment to bring salvation was imminent! Did you catch it? Not only that, he is admitting that “the judgment that is tied into justification was “at hand” and came in A.D. 70″! Do you catch the power of that? Joel Sexton admits, in spite of himself that “the judgment that is tied into justification was “at hand” and came in A.D. 70.” Well, as I have asked Joel repeatedly, did that judgment that is tied to justification and AD 70 come or not? He refuses to answer. But, Joel says: “Don thinks it’s great that the judgment that is tied into justification was “at hand” and came in A.D. 70.” So, Sexton admits to the very point I tried repeatedly to get him to address! He just gave away the farm. The problem is that Sexton is openly ridiculing what the Bible has to say about when the world of righteousness would arrive. And, for the record, I do think it is great that I honor the Biblical testimony about when the judgment tied to justification was ‘at hand” and came in AD 70. I do not ridicule that. I do not reject that. I do not pervert that. I do not ignore it as Joel Sexton is doing. I accept it, and Sexton needs to accept it as well. But to continue on Daniel 9 as we continue Responding to the Critics. Seventy weeks were determined to bring in everlasting righteousness. The seventy weeks were to end no later than AD 70. Therefore, everlasting righteousness was to become a reality no later than AD 70. The world of everlasting righteousness of Daniel 9:24fd is the New Creation world wherein dwells righteousness of Isaiah 65-66 / 2 Peter 3 / Revelation 21-22. (If this is not true, Sexton needs (must) prove it). The world of everlasting righteousness of Daniel 9:24f- the New Creation world wherein dwells righteousness of Isaiah 65-66 / 2 Peter 3 / Revelation 21-22- would arrive at the Day of the Lord. (2 Peter 3 / Revelation 21f. Therefore, the everlasting righteousness of Daniel 9 would arrive at the Day of the Lord. The everlasting righteousness of Daniel 9 would arrive at the Day of the Lord. The everlasting righteousness of Daniel 9 would arrive no later than the time of the fall of Jerusalem in AD 70. Therefore, the Day of the Lord to bring in the New Creation of everlasting righteousness, was no later than the time of the fall of Jerusalem in AD 70. Now, if Sexton is right (he isn’t) to claim that if the judgment has taken place there is no salvation today, then of logical necessity, unless he can show that there are two different worlds of righteousness foretold in Scripture, or unless he can show that our analysis of Daniel 9 is wrong, then he has entrapped himself in his own claims. So, Sexton needs to tell us when the seventy weeks of Daniel 9 ended. He needs to tell us if the everlasting righteousness of Daniel 9 is different from the New World of righteousness of Isaiah, 2 Peter and Revelation. And if he claims they are different, he must prove it. If he admits that the everlasting righteousness of Daniel is the same as in Isaiah, 2 Peter, Revelation, then his claim about justification is falsified, because the arrival of the world of righteousness of Daniel is confined to the seventy weeks ending in AD 70. If he admits that the everlasting righteousness of Daniel is the same as in Isaiah, 2 Peter, Revelation, but, insists that the judgment to bring in that world of righteousness is still future, he is thereby positing the postponement of the end of the seventy weeks beyond the time given in the text! In other words, if Daniel 9 is the prediction of the yet future judgment and time of objective justification, then the seventy weeks are not fulfilled! Will Sexton now adopt the Dispensational Gap Doctrine of a postponed seventieth week? The fact is that Sexton’s own admittedly “narrowly focused” argument omits, negates, distorts and denies the wider Biblical discussion of justification and righteousness. It is actually “narrow minded” to refuse to accept all of the Biblical datum related to the issue. Since when is it wrong to bring other passages into the discussion of a topic? That is normally considered the proper hermemeutic. Yet, Sexton has strongly ridiculed me, and called me un-Christian, deceptive, dishonest and other names for incorporating that wider evidence into the discussion. I suspect, sadly, that this article will elicit that very kind of continuing caustic diatribe, instead of a serious, collegial discussion of the issues involved. Unfortunately, what we have witnessed from Sexton over the last few weeks is a growing shrillness in his posts. We have witnessed a dramatic increase in his abusive name calling. We have seen a disturbing willingness to question my integrity constantly calling me dishonest, deceptive, and a host of other less than complimentary adjectives. As I have noted on many occasions, after countless debates, when someone is trapped and realizes that their doctrine cannot be sustained, they grow desperate. They grow hateful. They become abusive. They often become crass and profane. In sum, they exhibit a decidedly un-Christian behavior, demeanor and language. This is precisely what we are witnessing with Joel Sexton.